I have a confession: I am a souvenir pack rat. From guide maps to old receipts, I have a habit of holding onto tidbits from my Disney Parks visits. Sadly, these once-sentimental keepsakes now live inside a shoebox in my closet. Then it hit me: I needed to think outside the shoebox! Today, I’m here to show you that one man’s trash is another’s DIY project. If your Disney Parks guide maps and tickets are too special to toss, I’m going to help you “Show Your DIY Disney Side” with step-by-step instructions for fun, simple projects perfect for seasoned crafters and beginners alike. 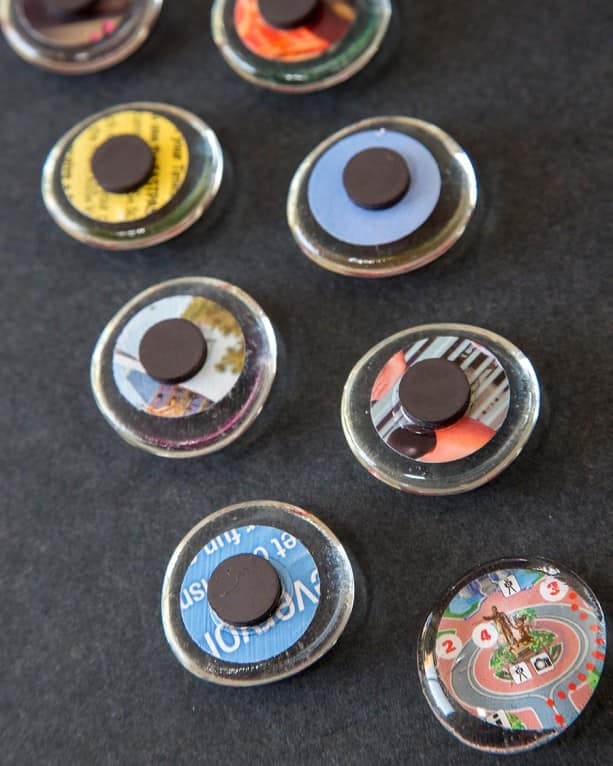 Let’s start with a quick and easy project: guide map magnets. For mine, I used two Disneyland Resort guide maps and cut out my favorite attractions. 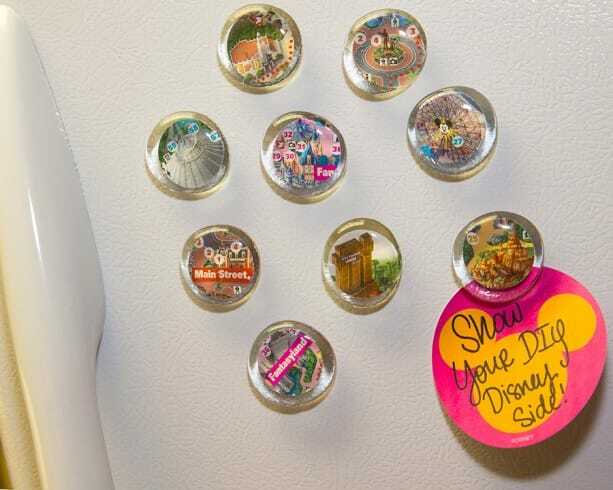 Whether for the home or office, these magnets are a unique way to turn any space into the happiest, craftiest place on Earth! 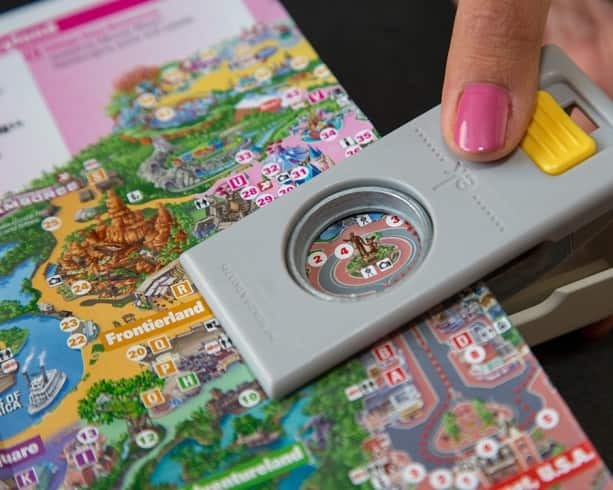 Step 1: Using a paper punch (or scissors), cut the desired illustration out of park map in a 1” circle. Make sure the cutout is the same size as, or a little smaller than, the glass stones. 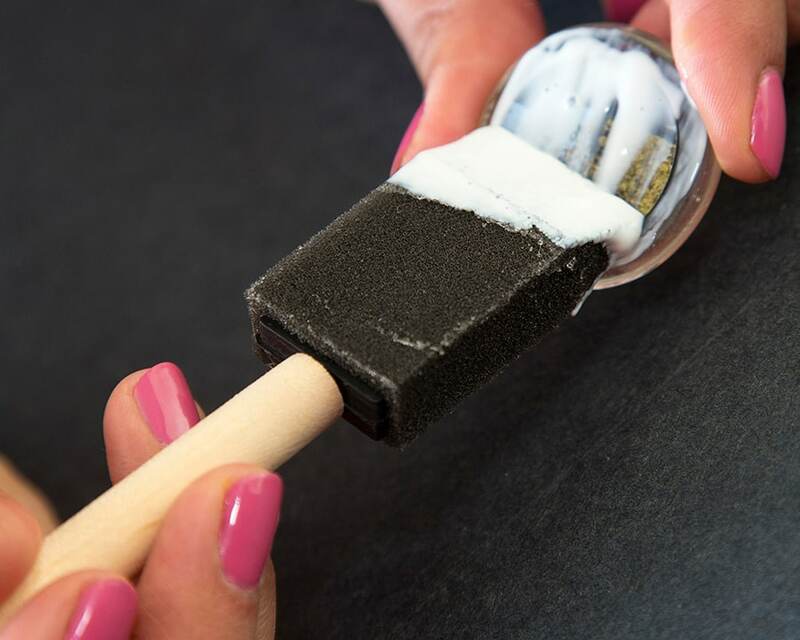 Step 2: Use a foam brush to paint a thin layer of decoupage glue onto the flat edge of a glass stone. Immediately place your paper cutout onto the stone so that the illustration is face-down on the glue. Allow to dry 10-15 minutes. Tip: Decoupage glue dries fast and is pretty unforgiving, so make sure to have your cutout ready. Step 3: Paint a thin layer of decoupage glue over the cutout to hold the paper in place. Step 4: Once the paper is dry (10-15 minutes), use a dot of crafting glue to attach a small round magnet. Repeat with as many cutouts, stones and magnets as you please. Wait for crafting glue to dry completely before using the magnets. How do you “Show Your DIY Disney Side”? Tell us in the comments! I made a ton of theses with my maps from WDW. I just need to get more magnets! These are great! Always remember that the shower curtains usually have round magnets, so cut them out before you throw it out for a new one. These would be great for decorating the stateroom door on our next Disney cruise! Just glue a layer of flannel or felt on the magnet back to make sure it doesn’t mar the paint. Thank you so much for posting this! I just made them and it’s VERY fun! I found the glass stones at a dollar store, and they have similar at Michael’s for about $4. I’m going to make these for my friends and family as gifts. Yay! How odd, Monica! That’s where I got mine but inventory may vary in different locations. If you look in the floral section, you may find flat, round, clear stones used for filling vases. That’s what I used. Good luck! I just love this idea. I collect all the different maps for my scrapbooking. So, now I have another way of using my extra maps. Clever! What a good idea for a Fish Extender gift for Disney Cruise Line guests. This IS So Cool!!! I also have sooooo many maps,etc.!!! I’ll have to look for the clear glass stones. Hopefully Michael’s have them!!!! You should be able to find them in a craft store, like Michael’s. I love it! We are in Florida, and are WDW passholders now… but I grew up in Cali and can’t tell you how many old Disneyland maps, tickets, and fast passes that I still have sitting in boxes in my garage. Can’t wait to re-purpose them in a way that is unique and useful. I’m in love with this idea! Now I have to go buy all the materials! I reuse everything Disney I can. I use the “Mickey Really Swell” coffee cans for utensil holders in my Disney kitchen once the coffee is gone. I made a chime out of the sets of mini flavored coffee cans with all the characters on them. Everything is too cute to throw away! I’ve seen coasters made out of park maps, too. Just buy some cheap coasters and follow the same steps. 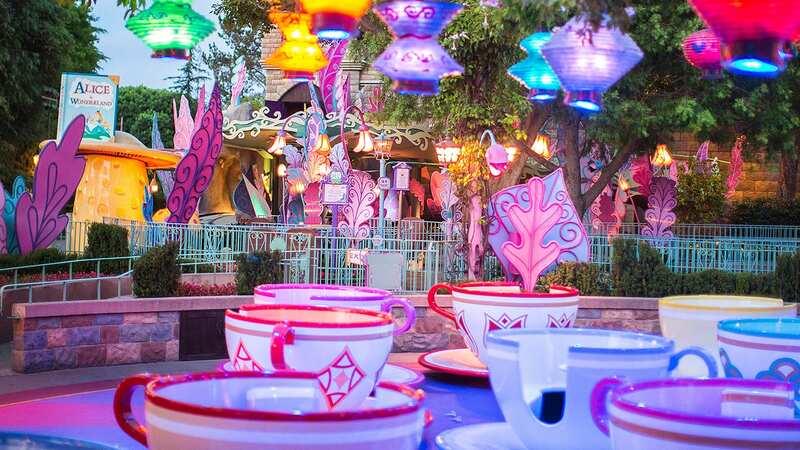 Instant Disney theme park memories! I love this idea.. I used an older set of maps I had and made coasters of each park. They are pretty awesome 🙂 Cannot wait to try this too! I’ve actually got a coaster project on deck, Malory! I’ll share that one soon. I’m not a very crafty type of guy, but I have to admit – that’s brilliant, Erin! Love this idea. I’ve also thought about making the celebration buttons into magnets as well. I need a good DIY project, thank you, Erin! Dinah – I heard from a fellow cast member today who makes magnets out of her celebration buttons and they’re really cute! Great idea.